'Doug Goodnight' OGB+ (Sharon McAllister, R. 1995). Seedling 86-9-13. AB, 24" (61 cm), Early midseason bloom. Very dark blue violet; style arms with prominent crests; black beard. 'Persian Pansy' X 'Rose of Sharon'. 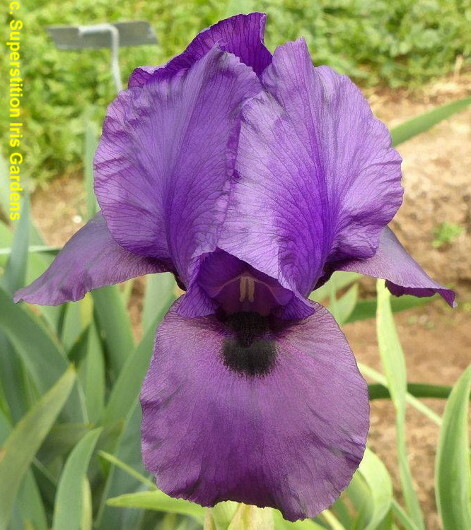 McAllister's Iris Garden, 1995.
jpg douggoodnight1.jpg manage 83 K 30 Mar 2019 - 03:01 Main.TLaurin Photo by Seandel Iris Gardens.